My sister and I made another delicious dish that is perfect for the colder weather. This is a quick recipe and quite versatile as you can choose any vegetables you like. Instead of prawns you can use chicken or beef and vegans and vegetarians can use tofu. We like to marinate the prawns the night before as this gives them more flavour. 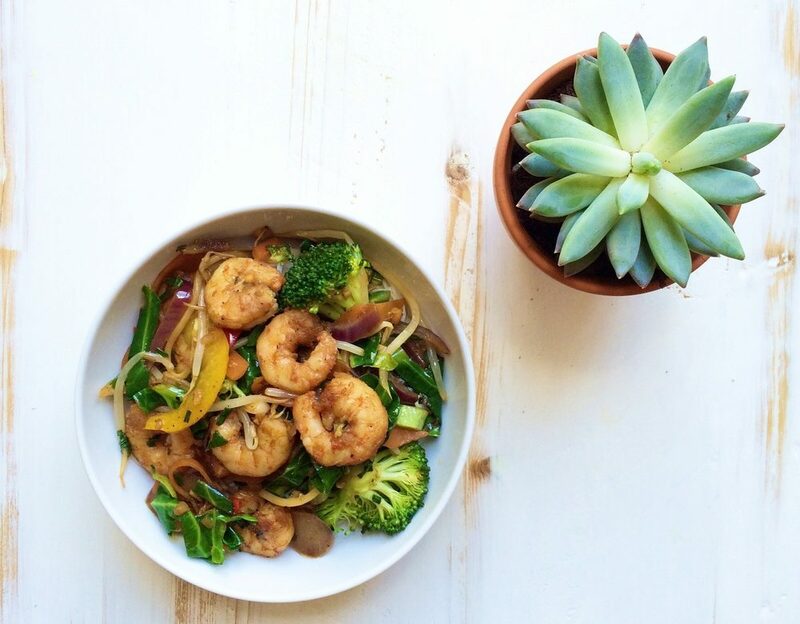 Place the prawns in a bowl with a generous amount of sesame oil, 1 garlic clove, ginger, chilli and 1 tablespoon of tamari sauce. When ready to cook, heat a wok and add sesame oil, garlic, ginger, chilli, spring onions and cook for 1-2 minutes. Careful not to burn the garlic. Add the remaining vegetables and cook for 1-2 minutes then add the marinated prawns and cook for 4-5 minutes until the prawns turn pink and the vegetables are tender. Add a little tamari. Once cooked taste to see if you need more seasoning and serve on top of the rice noodles and enjoy!